The title of this book, Watershed Dynamics, refers to the idea that streams, rivers, lakes, and other water bodies are dynamic systems, continuously changing in many ways—physically, chemically, and biologically. Have you ever wondered why some streams dry up during the summer while others continue to flow? Or where the water in a river comes from when the weather has been dry for several months? These are examples of the dynamic relationships that take place in water and the surrounding landscape. Every body of water interacts with the atmosphere, receiving precipitation and exchanging gases between water and air. Humans of course are an integral part of these dynamic systems, both affecting and being affected by water in all aspects of our lives. 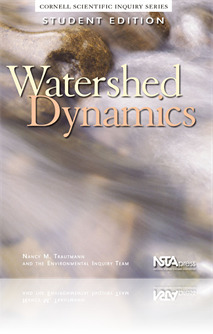 This free selection from Watershed Dynamics (Student Edition) includes the Table of Contents and Preface. This would be a great text for students beginning their study of watershed. In the Common Core, students need to be able to read complex text (but not too complex) to be able to understand and clarify an issue. With simplicity, the text outlines many of the different issues concerning water and why we need to understand where our water comes from.